Christian Bookmobile: COTT: Winner of COTT's September Clash! What Lies Beneath the Black Water of the Bayou? Hunter Galen, a New Orleans securities broker, suspects his business partner, James Nowak, of embezzling their clients’ money, but he’s reluctant to jeopardize their friendship. After James turns up dead, Hunter realizes his unwillingness to confront a problem may have cost James his life. Nicki Price, a newly minted PI, intends to solve the stockbroker’s murder as she establishes herself in the career she adores. As she ferrets out fraud and deception at Galen-Nowak Investments, Hunter’s fiancée, Ashley Menard, rubs her the wrong way. Nicki doesn’t trust the ostentatious woman who seems to be hiding something, but is the PI’s growing attraction to Hunter—the police’s only suspect—her true reason for disliking Ashley? As Hunter and Nicki encounter sophisticated shell games, blackmail, and death threats both subtle and overt, danger swirls around them like the mysterious dark water of the bayou. Only their reliance on faith and fearless determination give them hope they will live to see another day. --I normally enjoy reading mostly Amish fiction. But, because Mary Ellis is such a wonderful writer, I would choose Midnight on the Mississippi. --Mary Ellis, Looking forward to reading this.! Congratulations ! --Love to read books written by Mary Ellis. She writes great stories. --Mary Ellis, wishing you much success with this one! --Just love Mary Ellis writing style and always look forward to new releases !! --Love your books, Mary! Best of luck with MIDNIGHT ON THE MISSISSIPPI! --Mary Ellis pulls you into the story in the first few pages! --Mary Ellis, love her work. She writes a character so well, you can feel like you know them, and you can't wait to see what's on the next page. Mary has written twelve bestselling Amish fiction novel along with three historical romances. She is currently working on a romantic suspense series called Secret of the South mysteries for Harvest House Publishers. 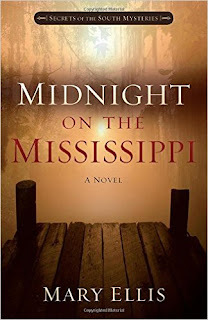 First of the series, Midnight on the Mississippi is set in New Orleans and was given 4 1/2 stars by RT Book Reviews. Book two, What Happened on Beale Street, is set in Memphis and will release in March. She is a former middle school teacher and lives in Ohio with her husband, dog and cat. She can be found on the Internet at her Website or on FaceBook.